Avoid use of nails as they cause dimples in the sheets leading to leaks. Always insist on 8 mm diameter galvanized J or L hooks with hexagonal nut, rubber and GI Steel cup (limpet) washer only. 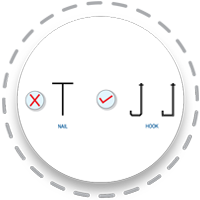 The J/L hook assembly should consist of a rubber washer, a GI Steel cup washer that matches your corrugation profile and a hexagonal nut (avoid square nuts). 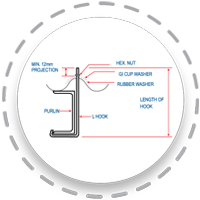 Ensure that there is a minimum 12 mm projection of the hook beyond the nut. Incorrect Orientation of purlins affects the performance of sheet fasteners. It is always advisable to check that your J/L hook rests fully on the back of the purlins. This prevents sheet sliding and ensures trouble free fixing. For a roof slope of 15-18 degrees the minimum side overlap between sheets should be at least 1 corrugation. Higher side overlap are better for heavier rainfall areas and low slopes. Place the sheets with a correct overlap as shown in the diagram. A minimum end lap of 150 mm must be used. This is ensured by projecting each of the two sheets by 75 mm beyond the hook. A free overhang of 300 mm is safest. Use extra support (purlins) for additional projections. The larger sheets best project shorter sheets. Thus, shorter sheets (spanning over two supports) are best at the ridge. The eaves sheets ideally should span at least three purlins to protect the roof from wind uplift generated at eaves from the overhang portion. The sheet must be laid from eaves to ridge while for cladding they need to be laid from bottom to top. The Ridge needs to have bolts connecting them directly to purlins at every 300 mm.